BAGRAM AIR BASE, Afghanistan, Jan. 28, 2008 – When the “Legends of Wrestling” tour rolled in here Jan. 26, service members and civilians gathered at the Morale, Welfare and Recreation clamshell to take part in the festivities. Diamond Dallas Page and the group of service members and civilians who were tough enough to survive the intense “Yoga for Regular Guys” workout give DDP’s famous “Diamond Sign”. Professional wrestling greats Nicholai Volkoff, Greg “The Hammer” Valentine, Diamond Dallas Page, and legendary manager “The Mouth of the South” Jimmy Hart took pictures and signed autographs for wrestling fanatics. Trivia questions were asked of the crowd, those who gave correct responses won hats and T-shirts. Pfc. Michael Grandi Jr., of Headquarters and Headquarters Company, 101st Combat Aviation Brigade, holds the WCW Championship belt as he takes a photo with wrestling greats (from left to right) Greg “The Hammer” Valentine, “The Mouth of the South” Jimmy Hart, Diamond Dallas Page and Nicholai Volkoff during the “Legends of Wrestling” tour which came to Bagram Airfield on January 26. For some die-hard wrestling fans, the event was a dream come true. “I became a wrestling fan in 1999 after constantly seeing it on TV,” said Army Pfc. Michael Grandi Jr., a member of Headquarters and Headquarters Company, 101st Combat Aviation Brigade, who has attended numerous live wrestling events. 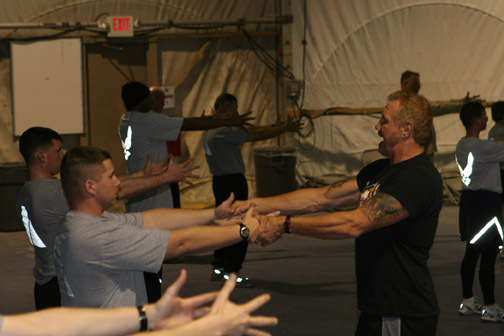 Former professional wrestler, Diamond Dallas Page, checks a Soldier’s posture during an hour long session of his “Yoga for Regular Guys” workout. Page along with several other wrestling greats visited troops at Bagram Airfield on January 26. Page introduced the audience to his no-impact workout system, which he calls “Yoga for Regular Guys.” Page said he scoffed at the idea of yoga until a spinal injury threatened to keep him out of the ring. At the completion of his rousing speech, Page received a standing ovation from the audience. After signing more autographs and taking photos with fans, he led all those who stayed behind through an intense hour-long session of Yoga for Regular Guys. The program, which consisted of slow-count isometric exercises, static holds and various yoga poses, managed to raise heart rates and get the crowd sweating.